How do locals get good food when the produce shipped up from the Lower 48 is often so expensive and not so fresh? It’s an issue of concern for rural areas across the state. For some people, the answer is to cultivate a garden. For others, it’s about providing education. 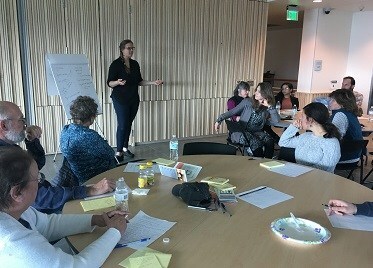 That’s some of what attendees talked about at an open forum last week hosted by the the Kodiak Area Native Association and funded in part by the First Nations Development Institute. Alaska Pacific University Professor Rachael Miller facilitates the forum. Joining her are community members, gardeners, and local food fans. They brainstorm, split up into groups and share their thoughts. Jane Eisemann brought up the disregard for food’s value and talked about the food waste she’s observed. She said she’s watched high school students chuck food into the garbage at lunch. It may indicate a disconnect between consumer and grower. In Kodiak, some gardeners sell their produce at the farmer’s market in the summer. KANA project coordinator Tyler Kornelis – who helped organize the forum – says the community needs to put control back into their hands. “Even if it costs a little bit more from time to time, you still have to purchase locally to be able to sustain that living wage that was talked about earlier,” Kornelis said. Other concepts people toss around are a shorter work week to make time for gardening and exchanging services and food with neighbors. Miller, who wrote everything down as it came at her, later said she, like the attendees, has a lot of ideas. She said they point to a big question. Miller said, at the end of that period, she’ll release a Kodiak region food sovereignty assessment. Miller said she’ll publish the assessment at the end of August. Kayla Deroches is a reporter at KMXT in Kodiak.